First thanks to BSNL , who provided this Internet wireless facility , that I can write my Blog with the first man account of Floods around my village Kadampara. I am now sitting at home , ready to face the ultimate disaster. The Floods of Kathjodi river, the main tributary of Mahanadi River is going to come with in some hours from now. The Radio Warning on All India Radio is making all there best efforts to alarm the local public about the coming floods. Now at this moment of time , Most of the Mahanadi is flooded and we are in the waiting list, unlike railway tickets, no one wants to be Confirmed. Let me tell you that the 42 Mauja, or the Bayalish Mauja as we called is a island on the river kathjodi, consist of 42 villages in all. My village Kadampara is the 2nd from the River basin and the most hard hit one if the situations goes worse.. With the birds eye view of the River Kathjodi, the River is already on the last danger level and we may face the Floods very soon, by this evening. 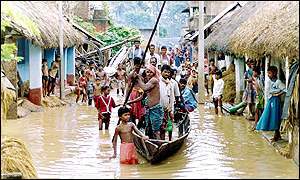 People are experienced with the 2001 floods and have the insight to make there best efforts to avoid situations like that of Bihar. Its 1.23pm and I was writing this blog, while the family member were engaged in packing essential goods for survival, even my mother is shouting from the back to make the arrangements instead of gluing to the Computer. People in the villages are dragging there livestock to the higer points. Obvious reasons to mention that this is one of the emergencies that this generation of village youths has to face. There is only one rule that is to be followed , i.e like in WAR they say Every one is for Himself, I had spoken to the youths in my own village regarding there own efforts in making themselves safe, so that in the coming ours we could have the time to evacuate the Children's,Elderly persons and Livestock to safer places, although the process are started . With all that told I was going to make my contribution and a break for the time being . Hope I will be available for the next post. Hope the best for the People. I'm using one of your wp themes at http://kayeshangout.com and I was wondering where in the files I change the graphics to be my own and how?? ?